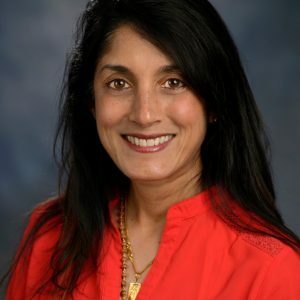 Dr. Shanta R. Dube joined School of Public Health in 2014 as Associate Professor in the Division of Epidemiology and Biostatistics after a 14-year career at the CDC. Dr. Dube started her public health career at CDC in 1999 when she was awarded the Association for Teachers of Preventive Medicine Fellowship to serve as an early investigator on the Adverse Childhood Experiences (ACE) Study. She spent eight years on the ACE study and gained national and international recognition for her research, which focused on childhood maltreatment and the contribution to health outcomes across the lifespan. In 2007, she joined the CDC’s Office on Smoking and Health to lead tobacco control surveillance in the Epidemiology Branch. Her efforts included improvements in tobacco measures, survey mode capability, and the initial reports on the increased use of electronic cigarettes among U.S. youth and adult populations. In February 2013, she was lead for a CDC report documenting the high rates of smoking among adults with mental illness; it was the first report to demonstrate the burden of smoking at both the national and state level. She utilizes a two-generational, three-level prevention model she developed to address and prevent childhood adversities and their outcomes. Dr. Dube is also Program Director for a newly approved study abroad program in India focused on the study of Ayurveda Medicine for trauma healing and well-being. She has developed and delivered “The Why and How of Trauma-Informed Care” to school staff, healthcare professionals, and other adults working with children that integrates Ayurveda principles for self-care. She is currently Associate Editor for Child Abuse & Neglect. She has published more than 100 peer-reviewed articles and reports, some of which CDC recognized and awarded for scientific excellence. Dr. Dube continues to give talks and training on the ACE Study, trauma-informed care, and Ayurveda principles at numerous national and international conferences. Dube SR, Hu SS, Freedner-Maguire N, Dayton J. A Focus Group Pilot Study of Use of Smartphone to Collect Information about Health Behaviors. In JSM Proceedings, Statistical Computing Section. February 2013 Alexandria, VA: American Statistical Association. 5452-5463. Dube SR, Thompson W, Homa DM, Zack MM. Health-related quality of life and smoking among adolescents: The National Health and Nutrition Examination Survey, 2001-2008. Nicotine and Tobacco Research; 2013 Feb;15(2):492-500. doi: 10.1093/ntr/nts163. Epub 2012 Sep 10. Dube SR, Cook M, Edwards VJ. Exposure to Adverse Childhood Experiences Among Adults—Findings from the 2002 Texas Behavioral Risk Surveillance System. Prev Chronic Dis. 2010;7(3). http://www.cdc.gov/pcd/issues/2010/may/09_0158.htm. Dube SR, Anda RF, Felitti VJ, Chapman D, Williamson DF, Giles WH. Childhood abuse, household dysfunction and the risk of attempted suicide throughout the life span: Findings from Adverse Childhood Experiences Study. Journal of the American Medical Association. 2001: 286, 3089-3096. Nominated for CDC’s Charles C. Shepard Award for Scientific Excellence.